A nice day at Legacy Golf Club. I’m a bigger fan of Florida golf weather than Florida golf. But since I’ve been spending more and more time in the Bradenton/Sarasota area, dodging Chicago snowstorms, and since I continue to like golf more than it likes me, you’re in luck. Here is a Very Incomplete Compendium of Golf Courses in the Bradenton/Sarasota area, which is about an hour south of Tampa on the lovely Gulf Coast of Florida, aka the Florida Suncoast in the Chamber of Commerce manual. One big reason this guide is incomplete is because there is so much golf here, even though these courses are generally packed to the gills. And a big reason I am doing this is because, when I was looking for guidance on where to play golf in Bradenton/Sarasota, I didn’find a lot of useful information on the web. But maybe that’s because my Google skills, like my flop shots, need work. With Rosedale ponds, “Look but don’t touch” is the best policy. GEOGRAPHICAL BACKGROUND NOTES. . . The Beach obviously is a huge part of the attraction to the Bradenton/Sarasota portion of the Florida Suncoast. And the beaches are marvelous, whether you’re reading a book, taking a walk, watching the sunset or actually going into the water. The best beaches are actually on the barrier islands, little strips of earth found between the mainland and the Gulf of Mexico. Near Sarasota, that includes Longboat Key and Siesta Key. Across from Bradenton, where I am based, the barrier island is Anna Maria Island. That kind of sums up these communities, which both have official populations of about 55,000 that swell greatly in the winter. One of the balancing acts of the area is deciding on your location. If you stay close to the preponderance of the golf courses, which lie along the I-75 corridor, you face that drive to the beach. It’s not an easy drive. East-west travel is on teeming surface streets in Bradenton/Sarasota. The commute is every bit as intense as the one I endure for golf as a city dweller in Chicago. I’m starting to have the same feelings about 53rd Avenue in Bradenton as I do about the Kennedy or Eisenhower expressways in Chicago. That said, the housing values and options for owners, especially golfers, are more attractive inland, near the golf. For seasonal renters, like myself, it’s nice to be nearer to the Gulf than the golf. 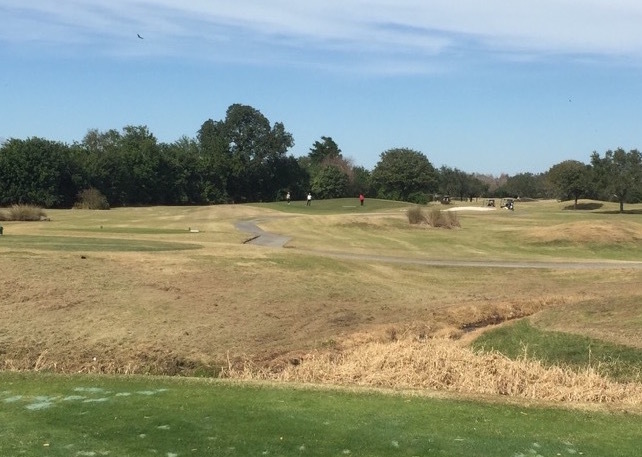 Tatum Ridge adds a rustic touch to Florida golf. AND NOW . . . THE GOLF. . .
West Bradenton, where I am based, is not loaded with golf. There is the Manatee County Golf Course, which is delightfully close to the beaches of Anna Maria Island. Ignoring the mixed reviews I read online, I found Manatee to be more than acceptable. It’s not through the houses, so it’s visually attractive. It’s wide enough that not every errant shot ends up in a pond. It’s a fun layout. It’s in decent shape, thanks to a recent “$100,000 facelift’’ that was apparently needed. The biggest issue, locals tell me, is pace of play, because the course tends to be solidly booked. I went early on a Sunday, and it worked out fine. It is definitely Not Fancy. But I’m not, either. Manatee County worked for me. Another heart-of-Bradenton option is the Pinebrook Ironwood Golf Club. This is an executive course—12 par 3s and six par 4s. And the par 4s are very short. Before you turn your nose up, let me say this: When I was there, the greens were excellent. Several of the par 3s were very challenging. Because it’s a short course, you can play there without consuming a whole day. It kind of reminds me of Jackson Park, on the South Side of Chicago, where I like to go for a quick and easy round of golf. And after chopping wood most of the day at Pinebrook Ironwood—why such a long name for such a short course?—I played the final three holes in seven strokes. Finished 2-3-2, 2-under, including driver/chip-in on No. 16, a 207-yard epic. I have never done that before. And will never do it again. Anywhere. Still in Bradenton is the IMG Academy Golf Club, which is used in the afternoon by the IMG Academy prodigies, but is not otherwise connected, if I am properly informed. IMG is a challenging layout, especially owing to the often difficult pin placements, which locals attribute to testing the young prodigies. I could do with fewer ponds and ditches. And IMG is through the houses. But it’s a good golf course. You just need to keep your wits about you in many places where the hazards exact a big price for errant shots. The more I play it, the more I like it. It’s much closer for me than the I-75 Corridor courses. And as a former country club, it has a really nice 19th Hole, with good food and beverage, and a lovely water view. It also has really good practice areas, if you’re into that sort of thing. An island tee at Misty Creek. Look closely, and you’ll see why the bird is wary. In trying to figure out the golf scene along Interstate 75 east of traditional Bradenton and Sarasota—what I call the I-75 Corridor—I imagine this is how Lewis & Clark felt when they set out to explore the Louisiana Purchase. There’s just so much going on out there. One of the problems is, when I went to the Golf Advisor, Trip Advisor and Yelp websites that Google turned up, many of the highly-rated courses turned out to be private. Or the reviews said things like, “Great place for a wedding. Or brunch.’’ Or “the greens were bad.’’ Two years ago. But there is an abundance of good golf along the I-75 Corridor. I kind of liked Tatum Ridge—and not just because I played well there. It’s a peaceful course, not through the houses. While it has its share of water hazards and other obstacles, single-digit players might want more. But Tatum Ridge doesn’t beat up average golfers. Its conditioning worked for me, especially around greens, where I could chip and putt. All in all, fun and pleasant. Oh, and by the way, conditioning tends to be a haphazard thing at unfamiliar public golf courses, wherever they may be. Greens that are slick one day might be slow the next, depending on when the lawn mower was out. Also, I have found some over-watered Florida Suncoast greens that run exceedingly slow, apparently because of maintenance or heat issues. 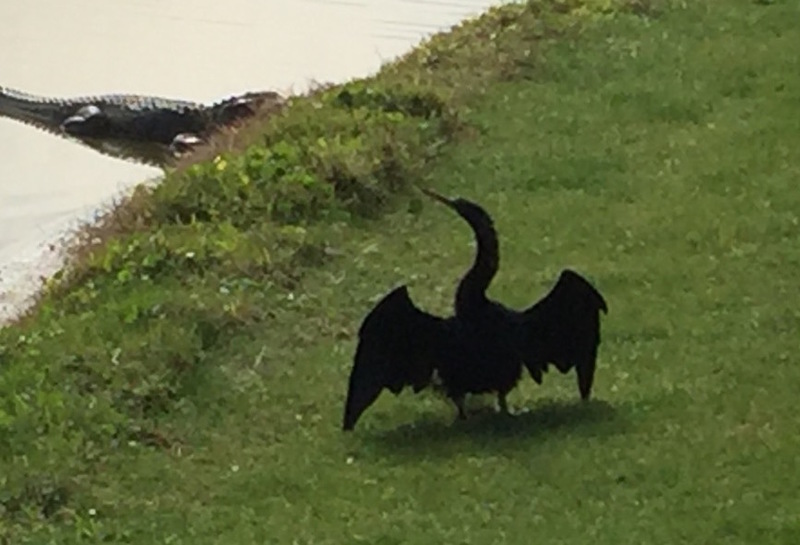 Is that an alligator taking cover from wild tee shots? Misty Creek is another pleasant course that has more of an out-in-nature feel than many of the housing-development courses. There are some places where local knowledge is a good thing. On No. 15, a hard dogleg left par-5, you don’t want to miss the dogleg. It’s not easy to see from the tee. But it’s there. And on No. 18, a short par-4, the water sneaks out in front of the green a lot father than you might expect. So drive up in the cart. That’s what it’s for. That’s a good rule to observe everywhere in Florida, where ponds sneak up on you. Ordinarily, I prefer short, tight courses to open, long tracks; I don’t hit it very far. The tricky part about Rosedale is that it’s visually deceptive. Some holes have trees on the right and look open on the left. But upon further review, there’s a pond lurking on the left. I will say this. I didn’t lose golf balls in the ponds. But I did fish my golf ball out of the pond several times. One-stroke penalty for ball-washing. Small price to pay. Rosedale might be deserving of another shot. The River Club had a little more going on than I tend to like. Very challenging in places. Owing to my limited skills, I don’t enjoy peril as much as some of my friends. But there were some interesting holes. No. 16, a par-4, features an island green. On the day we played, the wind was whipping. Since I had already punched out due to an errant tee shot, I was close enough to go for it, but not close enough to be comfortable. So yes, it was a thrill to hit a decent shot onto the green. But I’m not a thrill-seeking golfer. I’m very happy to grind. Then came the finishing 18th, which demanded a tee shot through a chute of trees and over a river. A do-or-die challenge, even from the most forward tee. If I hit 10 balls off that tee, I’m not sure two of them would find the fairway. I chose to take two and go to right. Holes like that are not my idea of fun, but that doesn’t make them bad. If you’re good player who hits it straight and likes to be tested, go for it at the River Club. The Highlands is one of three courses at the Meadows Country Club. All three courses used to be private, a member we were paired with explained, but public golfers now are able to play there to boost revenue. 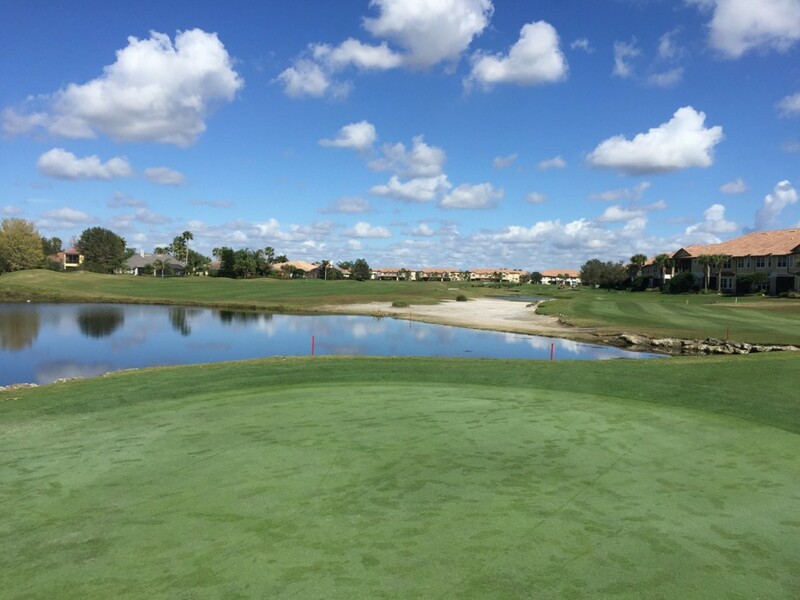 The course was Florida-housing-development classic. There were things I liked and things I didn’t like regarding the layout. Most of the holes were roomy enough, but the first hole, a narrow par-5, was probably not the best way for the course to start its pace-of-play effort. The Highlands also had a way-too-long par-3 over water. This is a design feature that is common along the I-75 Corridor of golf courses east of Bradenton and Sarasota. It makes no sense to me, though. If you have a 6,000-yard course for players who don’t hit it far, why would you toss in a 180-yard all-carry par-3? Especially when the bail-out options are limited? I don’t mean to single out the Highlands course. 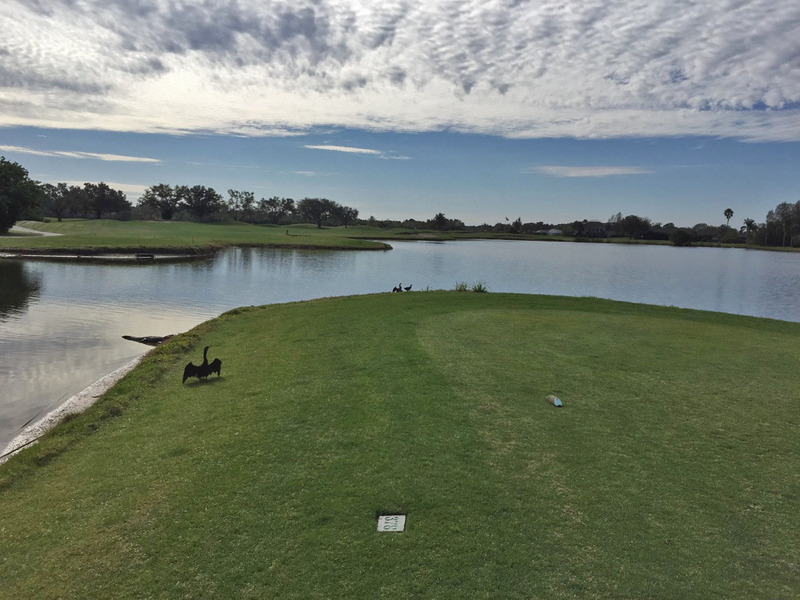 I encountered watery par-3s that were excessive for 6,000-yard golfers at many courses, including the Legacy Golf Club and the Manatee County course. Speaking of which, the Legacy Golf Club is a well-oiled golf course, an interesting Arnold Palmer design that gets a ton of play and accommodates it well. The greens were running slow the day we were there. That was because many of them had been watered excessively. We teed off at noon; this was not a dew issue. But no complaints. I’ve always believed players need to adapt to the speed of greens, and they rolled true enough. Legacy features a wide variety of holes. No. 1, an inviting par-5 that engages players, is followed by the strange second hole, a driveable (for some people) par-4 over a massive waste bunker. There also was a broad fairway way, at a sharp angle to the left of the line to the green. That’s a hole I’d like to play again. Similarly, No. 11 is a dogleg-left par-5 that is a bit of a mystery the first time you see it, but no big deal after that. The hole that I found really strange was No. 13, a par-3 that measured 173 yards from the 6,000-yard tee, all 173 yards of it over water, which also lined the left side of the green. The bailout, to the right, was no bargain—it left an impossible pitch to a back-left pin. Oh, well. . . Balancing this were many inviting holes. Overall, Legacy was a good experience: Florida golf, through the houses and around the ponds, enhanced by some interesting hole designs. One other note. . . 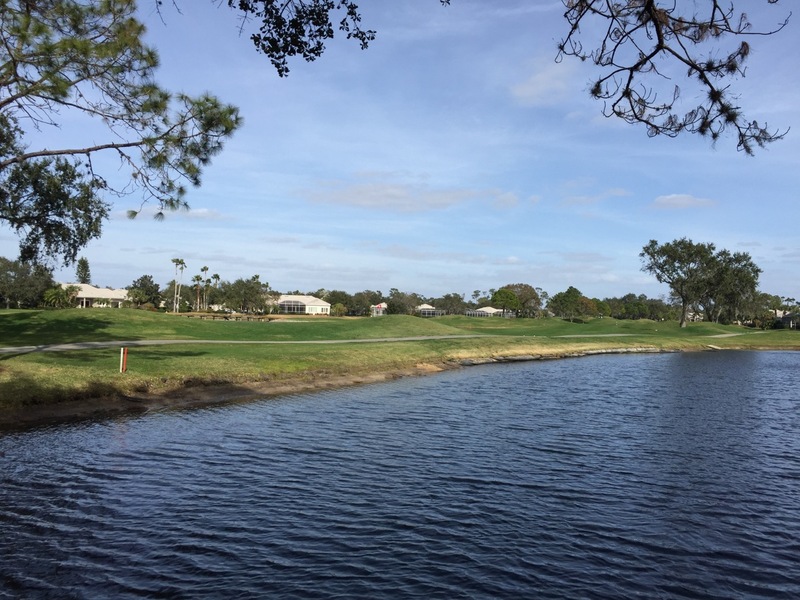 I hesitate to mention greens fees, at Legacy in particular and at so many other Bradenton/Sarasota golf courses, because of the wide variety of greens-fee options. Not only is there the usual dynamic pricing at various websites belonging to the golf courses and places like TeeOff and GolfNow. Many of these clubs have e-mail specials. They also have seasonal memberships. In other words, consult your local listings.